Madness I say. 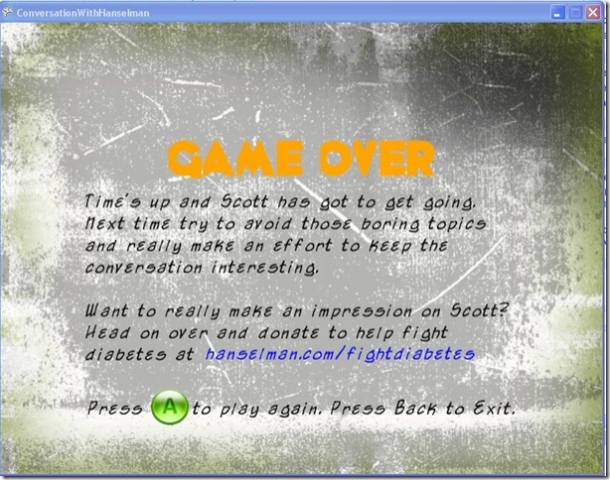 George Clingerman has created an XBox360 game using the XNA Framework called "A Conversation with Scott Hanselman." Yes, you read that right and I'm as shocked as you are. I've been told that conversations with me are as fun as watching paint dry, and I believe my wife when she says this. "It may have been my imagination (the drinks WERE free), but about 10 seconds into the conversation it suddenly occurred to me that Scott Hanselman was timing me. It was like the second I walked up to him, he visually assessed me and gave me a set conversation time, say about 2 minutes and 27 seconds. He was keeping this internal timer running in his head and after the timer reached 0, he'd wrap things up and move on. It makes sense, he's a busy guy, got a lot of geek fame and if he's going to circulate or get anything done, seems like a practical thing to do. So as we're talking and I'm watching this timer that I'm imagining running just behind his left eye, I begin to wonder if there are "checkpoint" bonuses. Like maybe if I hit on an interesting conversation topic or say something in a clever way, will Scott increase my allotted conversation time? And then on the flip side, if I drone on or bore him, is he decreasing my allotted time and preparing to move on sooner? So yeah, I spent my entire 2 minutes and 27 seconds playing this imaginary game in my head. You do XNADevelopment? +10 seconds. Want to help me make a web browser for the 360? No? -10 seconds. You seem pretty drunk. -30 seconds. That was actually funny +10 seconds. Well, got to go." Now, you too can have that kind of fun on your Xbox or Windows machine. Seriously though, it's a pretty interesting little sample that shows a lot of the 2D Gaming Concepts that you'd need to know in order to create your own - more interesting - game. "The whole weekend demonstrates once of the concepts I picked up from Scott's interview with the author of the 4 hour work week. Create an environment to set yourself up for success. That's how I finished this game in a weekend. I took away the distractions, surrounded myself with the materials I needed to develop and I got it done. I had an absolute blast." This was a total surprise to me and I had nothing to do with it, but I want to give Big Thanks to George for this fine bit of fun and for, on his own, using his weekend project to help me raise money for Diabetes Research! Seriously, come on, does that REALLY look like me? I can get you the original picture if you want. It started as a sketch on a scrap piece of paper laying somewhere around the house. It was a weekend of coding madness so I'm not sure where all my notes and sketches ended up, but I'm sure I could dig it up for you. HEE! I believe I always accused you of talking in Windows. Does that win me 10 seconds? I think the pasted-on goatee look is hysterical, myself! Doesn't look anything like you. Your head tilt is about 11 degrees while the game pic clearly has about a 13 degree tilt. 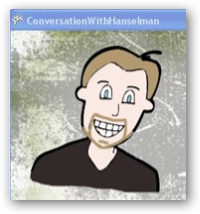 I've finally updated my XNADevelopment.com site with the "A Conversation with Scott Hanselman" as well, so hopefully some of these game developer hopefuls dig deep and leave you some donations. Speaking of which, I'd better step up and go leave mine now. LOL. I just noticed the tilt. Time for a new photo, methinks. Perhaps there needs to be a companion game, Conversations with Mo, with geometrically increasing penalties for every geeky reference ;). Funny :) Conversations with you are far more interesting than watching paint dry, but I always felt it took some special skill to hold your attention for more than about a minute. For instance, being able to maintain a conversation that lasted for an entire ride on a MAX train to your old neighborhood and back was an accomplishment to be proud of. I wonder if it would be cheating to wear an Emotional-Social Intelligence Prosthetic while playing?